It’s an artistic film noir alright, only the plot moves very slowly and there isn’t a whole lot of action or excitement. this movie has all the ingredients to be a top notch film noir, and yet it ends up falling way short of the mark. it’s got the arrogant protagonist who wants to live on the wild side and speaks in voice-over narration. it’s got the seedy underworld of people who surround him and dabble in illegal activity. it’s even got the femme fatale and the twist ending. but having the right pieces isn’t enough. they don’t go together with any connecting glue, that would lead one to the next. the actual crime, which should be the main focus of the film, ends up being the least explained and most unclear part. when the movie wants to be just about atmosphere and setup, it works nicely, but when it’s time to really deliver and become something more, it falls flat, as if it doesn’t know where to begin. Croupier is a very uneventful movie. it’s a crime film that feels extremely indie, with clive owen narrating us through it, the way old film noir detective movies used to do. this is a classic story of a guy who gets in over his head, and wants to just do a regular job and make some money, but ends up going for the danger that is dangled in front of him. in the first half, everything works fine, but when it’s time to get exciting and actually go somewhere, the movie falls way short of the mark. at the start of the movie, we are learning about this character, jack, a failed writer who is currently unemployed. he has a girlfriend who lives with him, but he seems to be living his life aimlessly without anything happening. what an interesting protagonist (sarcasm.) an old friend, who is an editor, shows up and wants jack to write a book from him, and jack gets started on it, only is not really sure where it should go, or how to make it work. that’s when his father calls from africa, where jack is from, with a job proposition. the job is a position as a Croupier, or roulette operator, at a casino. jack goes to the casino and meets with the boss, who tests him. the boss throws a bunch of chips on the table and then pulls out a stopwatch. he times how quickly jack can collect the chips, organize them, and stack them together neatly. sadly, this happens to be one of the more interesting moments of the movie. as he is starting up this job, jack also begins to get more interested in the book he is writing. he decides to name the main character jake, and to use jake as a model for things that jack is doing in his own life. when danger comes across his path, jack speaks in voice over about how jack would say no to this, but jake wouldn’t think twice about it and would easily say yes. and that’s exactly what jack does. he takes on the persona of his character. the problem is that we are never exactly sure of what jack agrees to. what we see is that everyone who works at the casino with jack seems to be involved in some kind of illegal activity. whether it’s cheating and stealing, like a short guy who works there and takes jack out for a night on the town, one evening, or the girl who is accused of stealing and gets fired, even though we don’t know if there’s any truth to it or not, everybody has got an issue. that’s when a mysterious woman shows up and wins a large sum of money at the table. jack sees her again one day, outside of the casino and approaches her. this is something he is not supposed to do, and is against the rules of the casino. the woman suggests that they go out together somewhere for dinner. jack tells her that if he is caught doing that, he can be fired, but then he goes along with it anyway, and starts seeing this woman. he even takes her away for a weekend at the home of that publisher who has approached jack about writing a book. when the woman shows up with a black eye, jack realizes that she is involved with some very bad people. he wants to help her out of her money jam, but is uncertain of how. then something happens to jack’s girlfriend, that is right along with the usual cliche in a movie like this. it’s meant to be exciting and surprising, but the pieces aren’t really explained as to how this happened or why. that’s basically the problem with the whole movie. it gets the little details right, but the important moments and plot points that we need are never made very clear. the main problem with this movie is that there’s just not enough. there’s a setup and introduction that is interesting, simply because of how basic it is. and then there’s a twist at the end. in between, there’s a new job and a femme fatale and a bunch of other characters who work at the casino that all seem to exist in a shady underworld of secrecy and deceipt. but none of this, short of the femme fatale, has anything to do with the plot. it’s all just backdrop and environment. if the plot focusses around the femme fatale and her money issues and need for jack to do something for her, then what exactly does she want him to do, and why does something have to happen to his girlfriend? knowing the twist at the end and how things work out, i still don’t understand why things needed to happen to her and who exactly did them. the only thing i get from it, is that the whole situation was meant to push jack into doing what was needed of him. 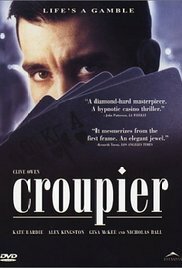 Croupier is an okay film. clive owen is right at home as this mellow guy who thinks he’s smarter than anybody else in the room. a lot of the movie does work, inlcuding the intial situations, atmosphere, and narration. what doesn’t work is the criminal plot and how little of it is actually explained. whatever does happen at the end, it’s not very exciting or climactic. the combination of not being given much and also not having things be explained to our satisfaction brings the movie to a screeching hault when it should have been continually moving forward.